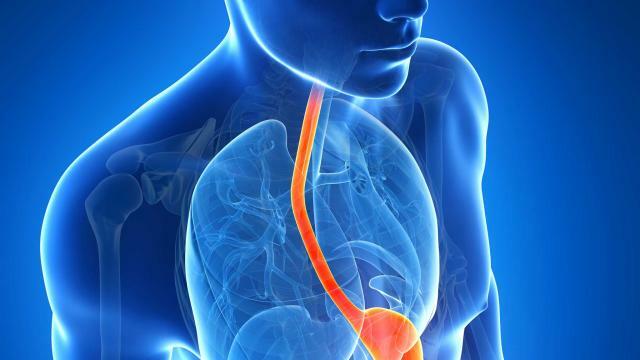 Many people experience indigestion from time to time, but when it occurs frequently, it could be an indication of gastroesophageal reflux, or GERD. This condition affects about 20 percent of Americans of all ages. Many pregnant women as well as people who are overweight suffer from GERD. GERD is a digestive disorder in which stomach acids, food and fluids flow back into the esophagus from the stomach. You may notice a burning feeling in the chest and throat or a bitter taste in your mouth. The burning, pressure or pain may last as long as 2 hours and is often worse after eating. Other signs that you may have GERD include: bad breath, coughing, abdominal pain, nausea, vomiting, difficulty swallowing and erosion of your teeth. GERD can become problematic and may cause health problems such as inflammation of the esophagus, esophageal bleeding or ulcers, and esophageal cancer. It may also lead to respiratory problems, such as asthma, fluid in the lungs, chest congestion, wheezing and pneumonia. A physician can sometimes diagnose GERD based on your symptoms and medical history. Other times, an upper GI series (X-ray examination of the digestive organs) or an endoscopy (procedure during which a flexible tube passes through the GI tract to take pictures) may be ordered. An instrument called a pH probe can be used to measure the flow of acid from the stomach. If you have been diagnosed with GERD, nutrition and lifestyle changes may help. Some strategies to alleviate symptoms include: quitting smoking, losing weight, wearing loose-fitting clothing, staying upright after meals and sleeping with the head of the bed elevated six to eight inches. It is also helpful to limit the use of chewing gum, hard candies, and straws because they can contribute to swallowing air, which often leads to belching and reflux. Fatty foods may contribute GERD symptoms because fat takes longer to digest than protein and carbohydrates. It is helpful to choose lean meats, poultry, fish, tofu and beans as protein sources. Cut back on dietary fat by limiting the amount of butter and oil in your meals, choose baked foods instead of fried, select low-fat dairy, and limit desserts. Certain foods may worsen GERD symptoms, so try to avoid peppermint, chocolate, alcohol, caffeine, carbonated drinks, citrus, acidic foods and spicy foods. The timing of your meals can also make a difference in how you feel. Avoid large meals and opt for smaller, frequent meals throughout the day. Eat slowly, taking about 30 minutes for a meal while chewing foods well. Avoid eating within 2 to 3 hours before bedtime to allow time for your meal to be digested. Although GERD can be uncomfortable, you may be able to find relief with nutrition and lifestyle changes. Stay in contact with your doctor and Registered Dietitian for guidance on the best prevention and treatment strategies.